Last week, I took a trip out to Spooks, Virginia. It’s located in Shenandoah Valley, and man is it beautiful there! It also happens to be where Polyface Farms is located. For those of you who follow the sustainable farming movement, or watched Food Inc—a documentary on sustainable solutions to food production—you might remember Joel Salatin. He’s the man behind Polyface Farms, and one heck of a passionate believer in creating the best possible system for both the environment and his livestock. Cozying up on bails of hay thrown on top of a flat bed trailer, which was pulled by a big tractor, we took our tour of the farm. A few times throughout the tour, they stopped the tractors and Joel answer questions as he explained his system for rotating animals. As we weaved around his property, you could not help but be taken in by the beauty of the lush green pastures and rolling hills. On our second stop, Joel explained how he keeps his soil and grass healthy, along with ensuring his animals get proper nourishment. Essentially, they rotate various animals in a specific sequence on the same field. If they aren’t able to get enough animals through the fields in time before the grass becomes too mature, they cut it and save the clippings as feed for the winter months. His words captivated me, particularly as I started thinking about the importance of disruption in all areas of life. Whether we’re talking about moving animals out of their comfort zone, disrupting the fields with grazing/cutting, or having difficult conversations, we need disruption to create the fertile ground for growth. While Joel was initially talking about his farming practices, he was really hitting on a much bigger idea that is critical for all growth. Whether we’re talking about the bottom line, innovation, career growth, or professional advancement, disruption, disturbance, or discomfort are critical elements of the process. —Test out new ideas continuously, with the expectation that they might fail. There is no success without failure—train yourself and your team to appreciate failure and disruption as you move toward growth and advancement. 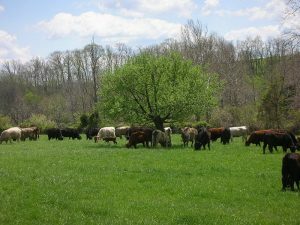 Keep rotating, learning, and disrupting your comfort zone—in time your pastures (team, career, balance statement) will be the same kind of luscious green of Joel Salatin’s farm. —Growing your bottom line, along with your people?